Microsoft Band 2 vs Microsoft Band: what's changed? The Microsoft Band 2 looks better then ever on paper but how does it compare to the first-gen Microsoft Band? There was a lot of griping about the older wearable so it should be interesting to see if Microsoft listened to the complaints and made improvements. The review of the new Band is finished so I decided to update this comparison of the two sensor packed fitness trackers so you can better see what's changed for the better. The first Microsoft Band wasn't exactly a looker. The all black look the company went for was likely to make it sleek and discrete but it mostly made it boring and forgettable for most. The new Band has a silver metallic finish on the edges instead of the plastic on the previous wearable. The clasp is also a silver finish this time around instead of a black metal finish. The power and action buttons are in the same place and match the silver edges of the new Band. These are slight changes but they do make it look more premium than the all black model. The new Microsoft Band is made of thermal plastic elastomer silicone vulcanate where the older one is made of thermal plastic elastomer material. The original Band's material is already comfy enough and good for workouts so the new Band shouldn't feel or function too differently. One of the biggest issues with the older Microsoft Band is its stiff and uncomfortable design, which is mostly the fault of its rigid, flat display. The new Microsoft Band may have alleviated this by integrating a curved screen. Not only does it promise to fit better on the wrist, it should make notifications easier to navigate. The Corning Gorilla Glass 3 AMOLED screen is larger at 32mm x 12.8mm (320 x 128 pixels) while the older Microsoft Band measures in at 33mm x 11mm TFT (320 x 106 pixels). The second-gen Band has a full color display and touchscreen like the previous one. They're both bright and slightly pixellated so there's no change there. 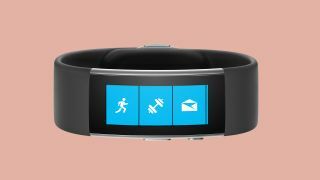 The new Band generally has the same features as the older version thanks to Microsoft's consistent software updates. There is however, the addition of a barometer sensor meaning you'll have an elevation tracker added to the 11 other sensors. All the fitness heavy apps will be back along with more features for golfers. The heart rate monitor remains on the back of the wearable, along with GPS functionality. The new Band (like the old Band) will be cross compatible on Android and iOS phones - just without the addition of Cortana. It looks like the AI is only available on Windows 8.1 and higher phones, and Windows 10 devices, though Microsoft has not elaborated further on what those devices are. Sadly, the new Microsoft Band isn't waterproof and only slightly water resistant. The official IP rating is still unknown but like the previous device, only light rain and splashes of water can hit the wearable. No dunking it in pools or wearing it in the shower. Most trackers with screens don't have a very long battery life and the first Microsoft Band was no exception. With a two day span, it averages out with what most smartwatches are capable of. The Microsoft Band 2 only lasts about two days, or 48 hours specifically with normal usage, according to Microsoft. The magnetic USB charger appears to be back and slightly remodeled likely to fit the new Band's shape. I've had decent luck with the Microsoft Band 2, and it's been lasting two days, and a little over. This is probably due to the lack of Cortana usage since I've only paired it with an iPhone 6S and Samsung Galaxy Edge. The older Microsoft Band was released at $199 (£170, about AU$230), and was considered surprisingly affordable for a fitness tracker that promised to do so much. The new one costs a bit more at $249 (£199, about AU$347). It's not too much of a price difference but the extra $50 should be worth it for the better fit, and the overall durable design. The second Band's barometer and curved screen are a nice touches that the first-gen Band sorely lacked. Still, the Band 2 isn't waterproof and it doesn't look like Cortana is available on very many devices. I was pretty pleased with the original Microsoft Band despite its shortcomings and it seems like the team did make some improvements to the wearable. After testing it out, I can recommend the Microsoft Band 2 as a decent fitness tracker to have. It's no fancy sports watch, but it's a step up from Fitbit or Jawbone if you're looking for a nice little screen.